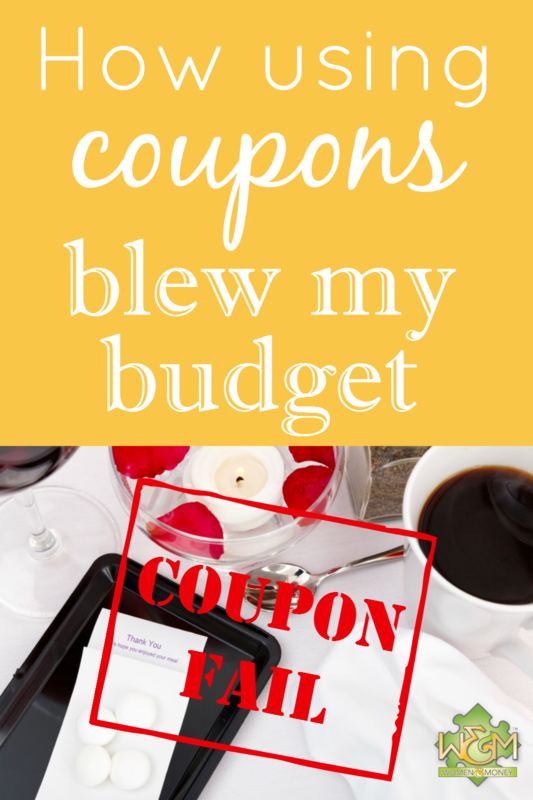 How Using Coupons Blew My Budget (Coupon Fail) - Women and Money Inc.
We had never been to this restaurant before so I checked out the website to read the menu, which had a variety of tasty sounding dishes as well as kid’s meals, but no prices listed. My husband and I didn’t have a dinner planned for that night, so we thought we’d pack up the kids and have a cheap dinner out. Upon arrival we saw the prices, which were higher than “fast food” but pretty average. Mine and my husband’s meals were $10 each, so with the coupons they were free. But the kid’s meals were $5 each, and our drinks were $2.09 each, so with tax and tip we ended up paying about $20 after the coupons. We saved 50% of the cost of our dinner. We enjoyed the food. So what’s the problem? We spent $20 on our dinner when we could have had a family meal at home for about $5. All because of coupons and a spur-of-the-moment decision. Because we didn’t have a meal plan in place, and we weren’t thinking about that extra $20 in our restaurant budget. To me, this is a coupon fail, because it caused us to spend more money on dinner than we would have if we didn’t use the coupon and eat out. This isn’t a huge blow to our monthly finances, but it’s occurrences like this that really start to add up if we don’t notice and avoid them. We should have saved the coupons for a time when we intended to or needed to eat out at a restaurant. Or we should have used them at a time when we could have walked away with free food and not had to buy the extra drinks and kid’s meals. The lesson here is to not let coupons influence your spending, and cause you to spend more than you otherwise would have, or even something you don’t need. The thrill of getting a great deal, and “saving” money is a powerful push to buy, but always consider the end cost and how that coordinates with your budget and financial goals. Is this something I already intended to buy? What will the after-coupon cost be? Does the end cost jive with my budget? This helps to put the “deal” into perspective and keep you from making this common coupon fail. Don’t let coupons blow your budget. Don’t be afraid to toss the coupon, or give it to someone who will make better use of it. This coupon lesson can apply to any type of “deal” really – a sale, a special discount, a BOGO offer etc. Try to avoid impulse purchases by giving yourself time to evaluate the decision. And always ask yourself: Am I really “saving” money with this deal, or am I spending money on this deal? This entry was posted in Budgeting, Personal Finance, Women and Money. Bookmark the permalink. Both comments and trackbacks are currently closed.